The template in the graphic below can help you develop your meetings with C-suite executives to discuss their specific needs. Structuring an initial meeting with executives follows the same format as the pie chart shown in that graphic, which suggests that your meeting should have an introduction, followed by a discussion of issues and implications, then deal with solution options, and end with moving forward. The chart suggests the relative amount of time that executives told us they feel should be devoted to each part of the meeting. Here you should refer to the initial phone call you made to the executive, citing your sponsor or referrer if appropriate. Give the executive a glimpse of some of your past experience, either in his current organization or with similar clients. Set an expectation for the mutual value you expect the meeting to deliver. Spend most of your time here during the first meeting. Ask questions that get you credit for doing your homework. Listen intently, and discuss the client’s key business issues, using their metrics. 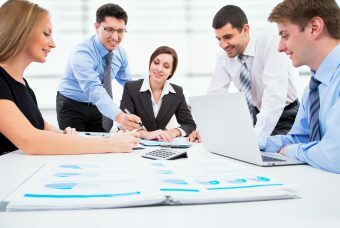 If your solution addresses and can provide value for a key business initiative, you will get the executive’s attention. 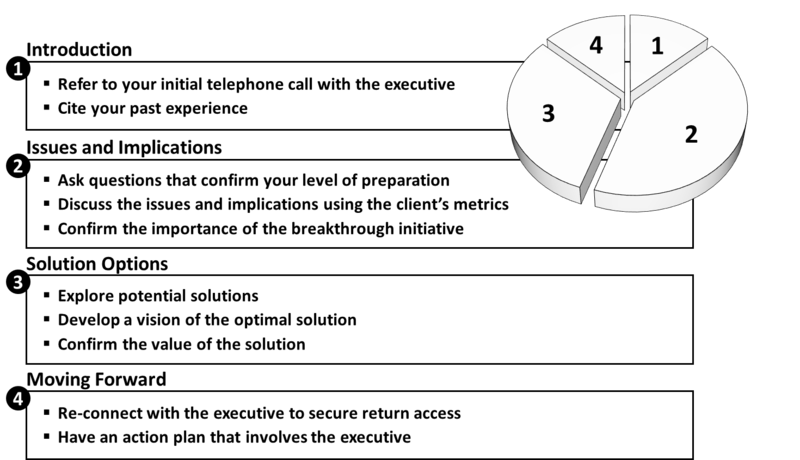 It’s a good idea to leave questions related to solution options for later in the meeting. Once you move to those questions, it’s often hard for both you and the client to step back to the broader, more strategic questions. “What effect has this problem had on your organization?” Use the knowledge gained from your research to expand on the situation. 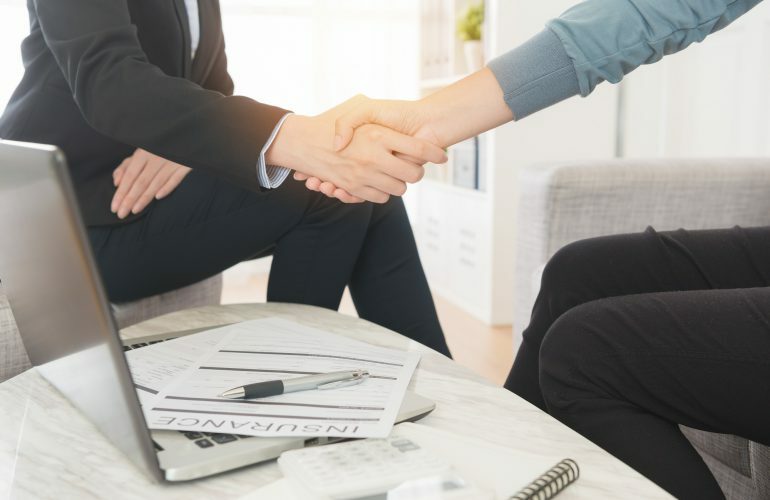 Only after the issue has been clearly defined and agreed upon should a salesperson begin to describe potential solutions that can be related to business value. Waiting until the end of the meeting to explore solutions builds credibility with the executive. Develop the executive’s vision of the optimal solution. Don’t necessarily reveal your company’s solution at this point, simply confirm the executive’s perception of what value looks like to him. Find a way to get the executive involved in a follow-up meeting to explore these issues in more detail. The executive might send you down to meet with a lower level executive. 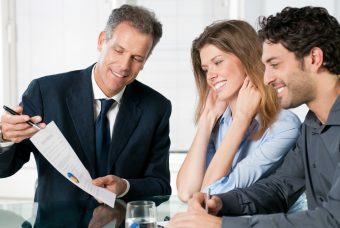 This is not always a bad thing if you ask her to make the introduction for you, and if she agrees to reconnect with you after that meeting to review your findings. Being able to legitimately say, “The boss sent me,” is like having a skeleton key that will open most doors. 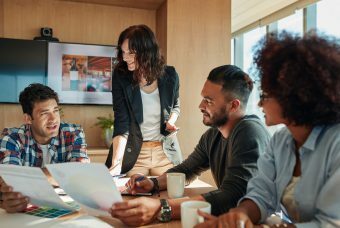 This structured approach for this initial face-to-face meeting with a C-Suite executive will yield significant results. Use it on a consistent basis because your first impression is so important! Want to learn more? Check out this webinar today. Dr. Steve Bistritz has more than 40 years of high-tech sales and sales training experience. He is a published author and speaks on sales, sales management and selling to executives. 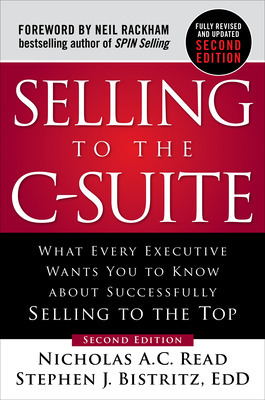 He co-authored the second edition of the best-selling sales book, Selling to the C- Suite. His website is www.sellxl.com. Dr. Steve Bistritz has more than 40 years of high-tech sales and sales training experience. He is a published author and speaks on sales, sales management and selling to executives. 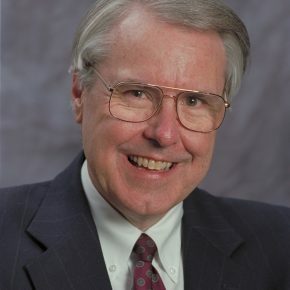 He co-authored the second edition of the best-selling sales book, Selling to the C- Suite, His website is www.sellxl.com.